I was Organizing my Photo Folder, came across some pictures which havent been used yet!!!! This recipe i tried from Mrignayani's Blog!!! She has posted the recipe in October, i tried the same day i saw her post!!!! I m just posting the Pictures of this Uber Delicious Strawberry Chocolate Bread, Please follow the link for the Original Recipe and Enjoy a Visual Treat and Drool over the Pictures!!! One of the reason i visit her blog, is just to read her post, Like many other people, i too love the way she writes!!! !Keep up the Good Work Buddy!!!! Str8 out of the Oven!!!!! my people to take this shot!!!! Sending this to Bookmarked Recipes - Every Tuesday Event (Volume -25) happening @ Priya Mitharwal's Mharo Rajasthan Recipes. Damn irresistible cake, that too the last click with chocolate sauce makes me drool..
lovely combo and perfectly baked bread. Thats an awesome combo,sounds very nice! totally delectable-- the sauce on the bread is super cool !! 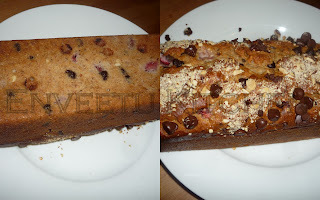 Looks good priya..I have been planning to do another eggless cake/bread too..